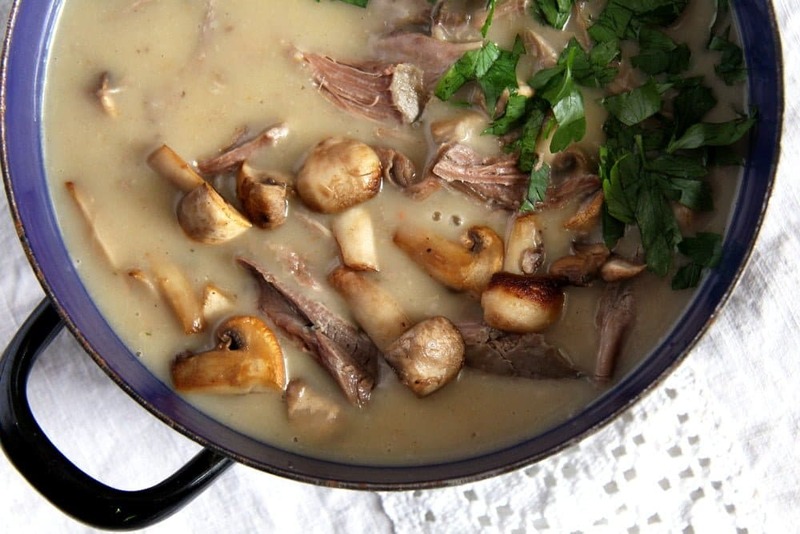 A very quick, creamy and delicious fricassee made with leftover turkey and fresh mushrooms in a velvety white sauce. This quick fricassee with leftover turkey is one of my favorite ways of using either leftover turkey or leftover chicken. Or chicken/turkey meat left over when making chicken stock. It is fast, it is always delicious and comforting and I can be sure to make my husband very happy with it, it is one of his favorite meals. The traditional way to serve chicken or turkey fricassee in Romania is with polenta, but for some strange reason, I have never enjoyed that combination. I absolutely love polenta, I think it is obvious to see that on the blog as well, I have lots of polenta recipes, but not necessarily with fricassee. So I have adopted the German way of eating turkey or chicken fricassee and that is alongside rice. 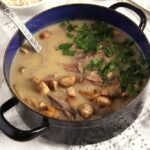 There are a few other changes I have made to my grandmother’s typical fricassee. First of all the above mentioned transition from polenta to rice. 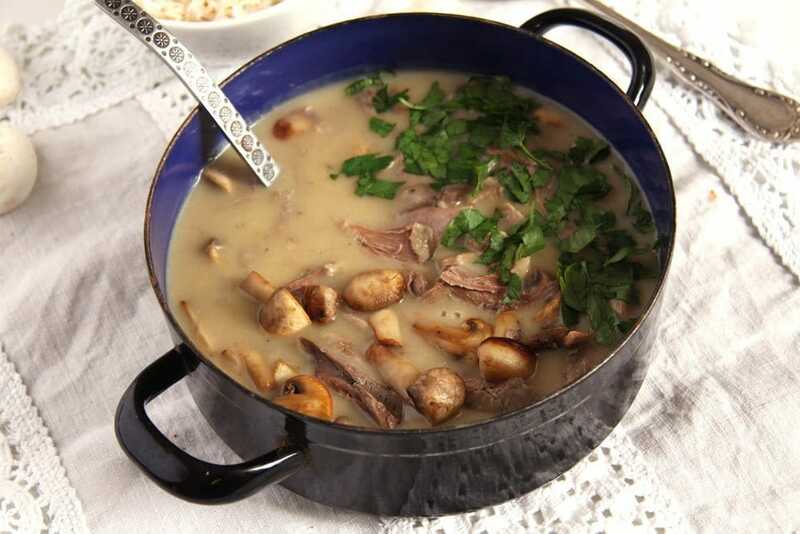 Then I also put quite a few mushrooms in my fricassee, the ratio of meat and mushrooms in my turkey fricassee is about 1:1. My mother-in-law always makes her chicken fricassee with canned mushrooms and it was my husband’s wish for me to add the mushrooms. I prefer fresh mushrooms, which I fry lightly in a bit of butter before adding them to the dish. Otherwise, there is nothing much I could say about this fricassee with leftover turkey, it is so straightforward and easy to make. An absolutely great way of using some of those leftover turkey from Thanksgiving or Christmas, but not only. If you do not have any chicken or turkey leftover, feel free to make this with poultry leftover when making stock or start from scratch. 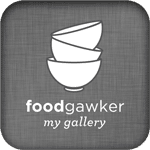 In this case, cook either 2 – 3 chicken legs/ 1-2 turkey drumsticks or about 450 g/ 1 pound chicken/turkey breast in about 800 ml/ 3 1/3 cups of water with some onion, 1 or 2 carrots, a piece of celeriac, bay leaves, salt and whole peppercorns. 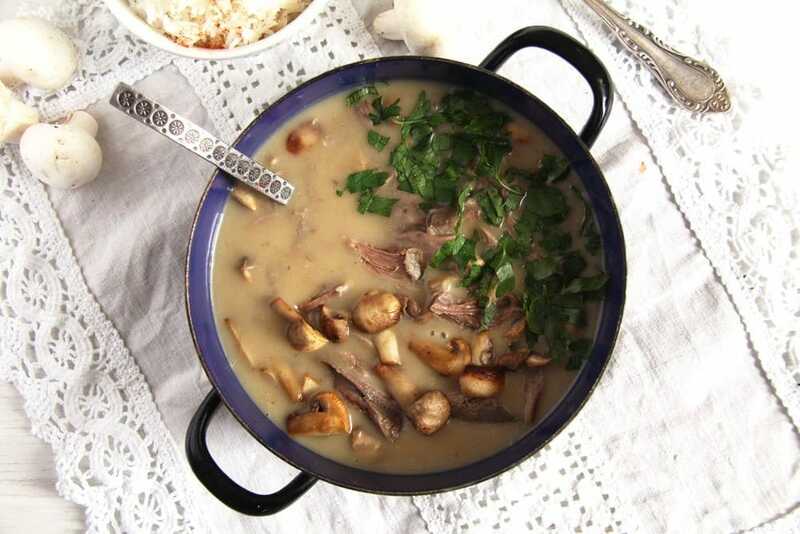 When the meat is tender, strain and keep the liquid for making the white sauce. Proceed with the recipe as described bellow. The only thing to keep in mind when starting from scratch is that your cooking liquid will need more seasoning than when using chicken or turkey stock to make the fricassee. The stock is normally cooked for a much longer time, so it develops more flavor than the liquid used to quickly cook the turkey or the chicken. So play with the spices here and be generous. If the cooking liquid doesn’t have enough flavor, you might consider adding a chicken stock cube, I prefer an organic brand, but do use your favorite kind. Read the last three paragraphs of the blog post if you don't have turkey or chicken leftovers and are making the fricassee with fresh turkey or chicken. You will only need the above-mentioned chicken stock cube in this case. If using leftover meat, cut it or tear it into bite-sized pieces. Halve or quarter the mushrooms, depending on their size. To make the sauce melt the 50 g/ 3 ½ tablespoons butter in a saucepan large enough to hold everything at the end of the cooking process. Add the flour and stir well for a couple of minutes, until the flour turns slightly golden. Slowly start adding the stock while whisking all the time, so that there will be no clumps in the sauce. Cook the sauce uncovered until thickened, about 10-15 minutes. In the meantime cook the mushrooms. Melt 1 teaspoon butter in a large pan. Fry the mushrooms until golden, about 3-5 minutes and set aside. When the sauce has thickened, add the cream, nutmeg, salt and pepper to taste. Be generous with the spices. Add the fried mushrooms and the turkey to the sauce and stir well. Let everything get hot, season again if necessary, sprinkle with chopped parsley and serve with rice. This looks so comforting! Also such a great way to use up leftovers. This looks absolutely delicious, Adina! I have never had fricassee but it looks so yummy and simple, too. 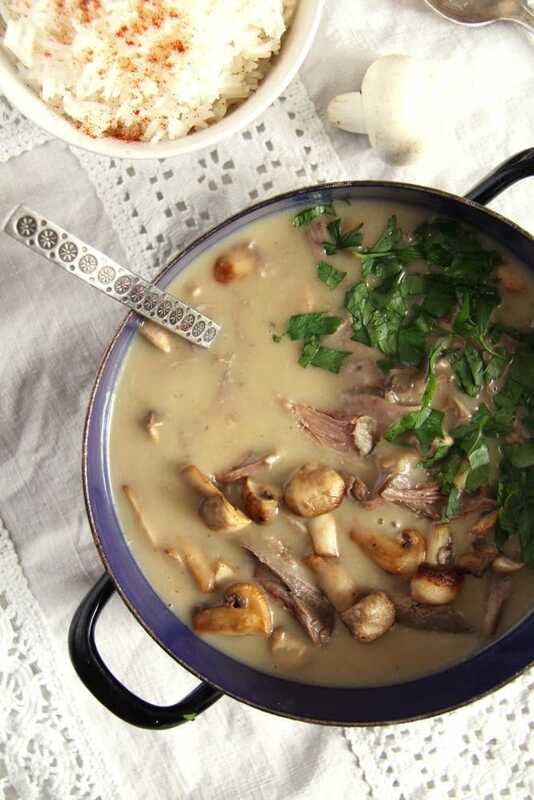 Love the addition of mushrooms – I could add mushrooms to anything! Saving this to try! Looks delicious – I can see why you and your husband love it so much. And I think I would prefer it with rice, too. I’m planning to try making smothered chicken with rice soon and this makes me think of that. This is great comfort food. Mushroom! I love mushrooms. Just by looking at those pictures makes me so hungry. Haha. And mixing this dish with rice a double win. It is a good way to finish leftovers from the fridge. Hee. A great way to put those turkey leftovers from the holidays to use. I love it! Simple and delicious, thank you. And as you say, a perfect comfort food. Thank you, David. Happy New Year!